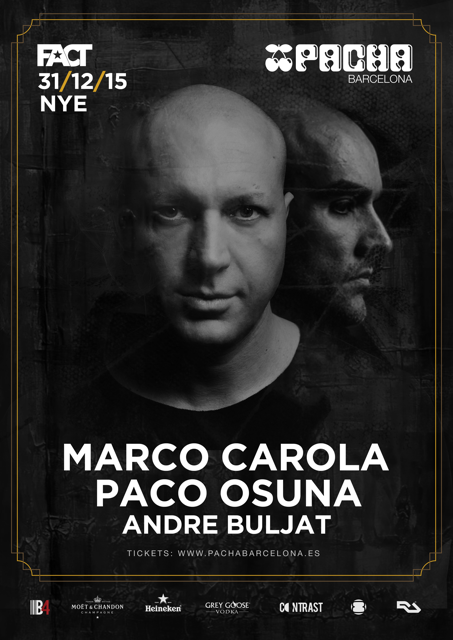 Pacha Barcelona rounds of its year with a New Year’s Eve party headlined by Marco Carola, Paco Osuna and Andre Buljat, an event that finds clubbing brands FACT and Pacha joining forces. FACT is apparently known for putting on events and label showcases all around the world, while Pacha is a clubbing institution that has a loyal following at its venues. Pacha's Barcelona outpost is a club which has spent big on production, lights, lasers and sounds. Supplying the sounds on the night will be Music On boss and Ibiza resident Marco Carola, who has been at the top of the techno game for decades and whose own party on the White Isle is one of the island’s most popular. Playing alongside him will be Spaniard Paco Osuna, who has released his wares on labels like Paco Mindshake, Drumcode, Plus 8, Minus and others. He plays many top clubs and apparently his recent Boiler Room set is one of the most watched. Rounding things out is Andre Buljat, long term FACT associate, who has been spinning techno and house inspired by Chicago and Detroit since he was a teenager. He is an accomplished DJ and has released music on labels such as Yakazi, N.19, CB Sessions and Intacto.